1 Physician Specialist in Cardiology. Fluminense Federal University. Niterói (RJ). Brazil. 2 Master Cardiology. Fluminense Federal University. Niterói (RJ). Brazil. 3 Medical Doctor in Cardiology. Fluminense Federal University. Niterói (RJ). Brazil. This paper was performed in the Department of Clinical Medicine. Faculty of Medicine. Fluminense Federal University. Niterói (RJ). Brazil. Travessa Elzir de Almeida Brandão, number 113 - apartment 303 - Block E - Neighborhood Santa Rosa, Niterói (RJ) - CEP 24.241-140. Brazil. Informed consent was obtained from the patient in question during the presentation of images in this article. This paper is part the thesis by Helio de Castro Junior, MD in termination of specialization in cardiology. Faculty of Medicine. Fluminense Federal University. Antonio Pedro University Hospital (HUAP). Niterói (RJ). Brazil. The Kearns-Sayre syndrome (KSS) is a mitochondriopathies characterized by multiorgan dysfunction that typically develops before the age of twenty. The diagnostic criteria most widely accepted in the literature are a triad: progressive external ophthalmoplegia, pigmentary retinopathy and disorders of cardiac conduction. KSS prognosis is related to the number of tissues affected and the severity of the alterations. In this article we report on a patient who presented 18 clinical features consistent with the Kearns-Sayre syndrome. In 1958, Thomas P. Kearns and George P. Sayre described through a report of a case a syndrome that presents with external ophthalmoplegia, pigmentary retinopathy and cardiac conduction block (CCB), which was later named: Kearns-Sayre syndrome (KSS)1-3. The KSS is a mitochondriopathies characterized by multiorgan dysfunction, which typically takes place before twenty years old. Cerebellar ataxia, hipoproteinorraquia, proximal myopathy, endocrinopathies, small stature and acid-base equilibrium disorders are other manifestations often associadas1,3-5. The KSS is a rare syndrome that belongs to a heterogeneous group of neuromuscular diseases caused by mutations in mitochondrial DNA. The phenotypic expression depends directly on the number of mutations in alleles and systems affected, directly interfering directly in the phenotype and severity of the syndrome. The cardiac conduction disturbance is responsible for high mortality syndrome. It is estimated that the ratio is 1.6 cases per 100,000 population6. The objective of this study is to describe a case of a patient with KSS and discuss the clinical and laboratory criteria, promoting the review of the literature on this topic. 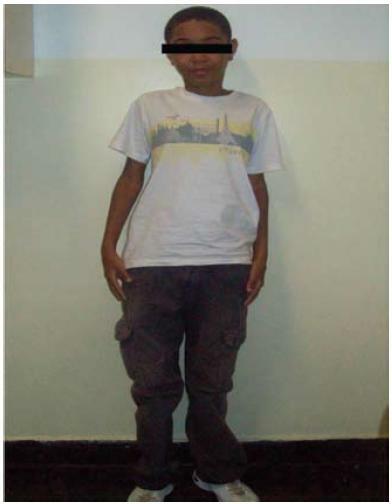 Male patient of 18 years, student, native of Niterói (RJ, Brazil), sought outpatient service complaining of progressive loss of visual acuity with the acceleration process in the last two years, associated with bilateral ptosis (Figure 1), small stature (Figure 2), delayed pubertal development and dyspnea on moderate effort with a history of clinical investigations inconclusive. Until then remained undiagnosed for two years, he developed the same symptoms and electrocardiogram (ECG) with complete right bundle branch block and left anterior hemiblock and growth hormone test positive with no indication of any therapy. Two months ago reported recurrent episodes of dyspnea with minimal exertion followed by syncope. 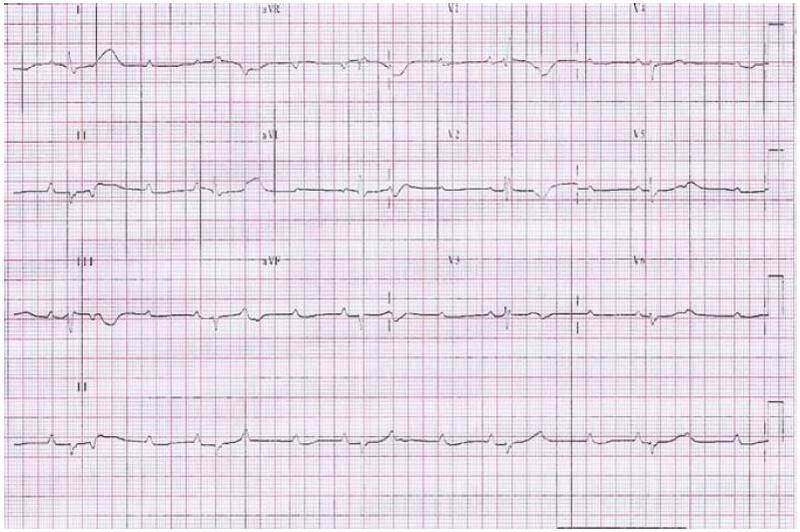 In the final episode of syncope was admitted to the intensive care unit and received a diagnosis of heart failure secondary to bradyarrhythmias and showed complete right bundle branch block, left anterior hemiblock and complete atrioventricular block (Figure3). Physical examination in ectoscopía highlighted: a marked reduction in visual acuity, muscle atrophy diffuse and bilateral ptosis. The cardiovascular examination, jugular venous pulse showed a cannon “a” wave and an irregular heart rhythm with breath systolic tricuspid focus more audible. Laboratory tests and chest radiographs were normal. A transthoracic echocardiogram showed cavitations size and normal wall thicknesses, as well as systolic and diastolic function of the ventricles. The adolescent remained hospitalized in intensive care unit with continuous cardiac monitoring, opting initially for transcutaneous pacing and subsequent permanent pacemaker implantation of a bicameral type. He moved to the floor on the third day of hospitalization and was discharged the next day. We were given guidelines to return to the consultation with your doctor and follow-up investigation of the underlying disease. After the clinical follow-up by specialists, based on clinical findings the patient was diagnosed as having a KSS and currently he is treated with coenzyme Q10, eye drops, calcium and expects a muscle biopsy. Maintains outpatient follow. Figure 1. Patients with Kearns-Sayre syndrome. Bilateral ptosis. Figure 2. Patients with Kearns-Sayre syndrome. Short stature. Chronological age of 18 years old. Height: 1.43 meters. Deficit in relation to bone age: 15 years. Figure 3. Patients with Kearns-Sayre syndrome. Electrocardiogram with complete right bundle branch block, left anterior hemiblock and complete atrioventricular block. The onset of clinical manifestations of this patient, even in childhood, coincides with the literature, since the KSS is characterized by ophthalmoplegia and pigmentary retinopathy, usually manifests before the age of twenty; however other changes are associated in several published case reports such as protein concentration, proximal myopathy, thyroid disorders, hypoparathyroidism, Addison’s disease, dysphasia in achalasia and renal tubular acidosis, short stature, cerebellar ataxia and cardiac conduction disturbance were also identified in the case reported3,6,8. The KSS is a genetic disorder caused by mutations in mitochondrial DNA. The inheritance of the mitochondrial genome is maternally, because during fertilization, the sperm tail, which contains the mitochondria, is displaced during the penetration of the ovule. Thus, it is not made part of the mitochondrial DNA of the zygote. Mitochondria are cytoplasm structures responsible for the production of intracellular adenosine triphosphate, which is necessary to supply energy for various metabolic functions. Tissues with high energy demand such as muscle and nervous system are particularly vulnerable to mitochondrial dysfunction, a consequence of deletions, rearrangements or other mutations in mitochondrial DNA. These mutations in most cases are random and are not usually inherited from the maternal DNA; the case example above the patient’s mother was phenotypic normal8. Due to the large spectrum of clinical manifestations, the KSS has several differential diagnoses, among these other syndromes mitochondria encephalomyopathies, CCB and oftalmopatias4,9.The most widely accepted diagnostic criteria in the literature are the triad: progressive external ophthalmoplegia, pigmentary retinopathy and CCB. This patient had all the classic manifestations of the syndrome, the muscle biopsy confirm the genotypic diagnosis, but would not add information for treatment and outcome6,9,10. The biopsy of skeletal muscle identifies the ragged-red cells (red fibers torn), and is specific for diagnosis of mitochondrial myopathies, plus the phenotype, the classic triad concludes the diagnosis of KSS. The technique for amplification of mitochondrial DNA by polymerase chain reaction, allows the diagnosis without performing the biopsy11. Several cardiac abnormalities are reported in the literature, such as disturbance of the conduction system, arrhythmia or syncope requiring pacemaker implantation, cardiomyopathy (hypertrophic, restrictive, non-compaction of left ventricle and peripartum)10,11. The CCB are described since the first case report of the syndrome in 19581,5. The most common is the left anterior hemiblock, isolated or associated with right bundle branch block are also found atrioventricular block 2º and 3º degrees. At the beginning of cardiac symptoms the patient presented in the case, we identified all these ECG changes and, as here, the majority of patients have indications for the implantation of permanent pacemaker or as a form of prophylactic treatment8,12. When a patient develops the KSS with heart failure and progresses to stage D, suggests that the mutation in mitochondrial DNA is not limited only to the conduction system, but also to the myocardium. The echocardiographic study to assess the systolic and diastolic functions of left ventricle by tissue Doppler allows the diagnosis of myocardial dysfunction and early-stage preclinical6,9. No specific treatment is effective for the KSS mainly for myopathy and retinopathy. The treatment is palliative and supportive for the clinical conditions. Some patients with myopathy benefit from the use of coenzyme Q10, especially those with mutations that produce reduced synthesis of this protein. The identification of these patients is important, since there are literature reports of clinical improvement and favorable prognosis8,13. These patients should be referred for detailed cardiac evaluation, investigating the need for permanent pacemaker or other cardiac-specific treatment. It is important to monitor multidisciplinary regular, given the systemic nature of the disease. Regular physical activity improves muscle strength, self-esteem and functional capacity4. We know that the KSS is rare in our environment and resources for diagnosis are not widely available, so that the doctor should have significant clinical suspicion for the diagnosis of the disease, indicating the cases selected for muscle biopsy and genetic research. KSS prognosis is related to the number of tissues affected and the severity of the alterations. The disturbances in the cardiac conduction system are responsible for high morbidity and mortality of the disease3,11. There was no financial support for this paper. 1. Kearns TP, Sayre GP. Retinitis pigmentosa, external ophthalmoplegia and complete heart block: unusual syndrome with histologic study in one of two cases. Arch Ophthalmol 1958;60:280-289. 2. Zago Filho LA, Shiokawa N. Síndrome de Kearns-Sayre: relato de dois casos. Arq Bras Oftalmol 2009;72(1):95-8. 3. Villacorta H, Catharina CV, Nogueira AS, Duarte MM, Roma CCC, et al. Bloqueio atrioventricular total em síndrome de Kearns-Sayre: relato de caso. Arq Bras Cardiol 1996;67(2):107-108. 4. Mita S, Schmidt B, Schon EA, DiMauro S, Bonilla E. Detection of “deleted” mitochondrial genomes in cytochrome-c oxidasedeficient muscle fibers of a patient with Kearns-Sayre syndrome. PNAS 1989;86(23):9509-9513. 5. Pfeffer G, Sirrs S, Wade NK, Mezei MM. Multi-system disorder in later-onset chronic progressive external ophthalmoplegia. Can J Neurol Sci 2011;38(1):119-23. 6. Nasseh IE, Tengan CH, Kiyomoto BH, Gabbai AA. Doenças mitocondriais. Rev Neurociências 2001;9(2):60-69. 7. Jarovsky D, Shiozawa P, Rosalino UA, Barros MD. Mitochondrial diseases: a review. Einstein 2006;4:343-350. 8. Nagahashi MS, Carvalho AS, Fonseca FL, Carvalho SM,Reed CU, Scaff M. Kearns-Sayre “Plus”. Arq Neuropsiquiatr 1999;57(4):1017-1023. 9. Limongelli G, Tome-Esteban M, Dejthevaporn C, Rahman S, Hanna MG, Elliott PM. Prevalence and natural history of heart disease in adults with primary mitochondrial respiratory chain disease. Eur J Heart Fail 2010;12(2):114-21. 10. Navas-Pérez A, Gurria-Quintana L, Vargas-Ortega J, Murillo-Correa C, Zenteno JC. PCR-based detection of heteroplasmic deleted mitochondrial DNA in Kearns-Sayre syndrome. Arch Soc Esp Oftalmol 2008;83:155-160. 11. Remes AM, Hassinen IE, Majamaa K, Peuhkurinen KJ. Mitochondrial DNA deletion diagnosed by analysis of an endomyocardial biopsy specimen from a patient with Kearns-Sayre syndrome and complete heart block. Br Heart J 1992;68:408-11. 12. Clark DS, Myerburg RJ, Morales AR, Befeler B, Hernandez FA,Gelband H. Heart block in Kearns-Sayre syndrome: electrophysiologic pathologic correlation. Chest 1975;68:727-730. 13. Channer KS, Channer JL, Campbell MJ, Rees JR. Cardiomyopathy in the Kearns-Sayre syndrome. Br Heart 1988;59:486-90.